The story opens up with a bang. Isadora is the bajillionth daughter of Isis and Osiris, living with them in their pyramid in Egypt. Unlike her god-powered brother Horus, Isadora knows that she is just one in a long line of mortal children who will die and be forgotten, replaced every twenty years by a new baby. When danger begins to surface at the pyramid, however, Isis thinks it’s best for Isadora to move to San Diego with her brother–and Isa decides she’s never coming back. That is, until her “normal” life becomes a little too real for her comfort. Oh yeah, and then there are those dreams that won’t stop about how her family is all about to die. I think my initial problem with this book is that Isadora is not a very likable character in the beginning. She’s whiny, she’s petulant and she’s spoiled. She’s really quite annoying. I had trouble being able to connect with her anger towards her parents–however justified–because I was stuck on the fact that THEY ARE ISIS AND OSIRIS AND THAT’S SO COOL. Plus, Isa kind of wouldn’t shut up. I was excited when the story moved to San Diego, but then she gets whiny with her brother too and it’s like, REALLY ISA PLEASE. However, once she gets to San Diego, the real character development starts. She steps outside her comfort zone, makes friends and starts being less emotionally stunted. Given the severity of her annoyance factor in the beginning, her character arc makes more of an impact for sure–if you can get past that first part of the book. I promise, it does get better, with great results. Can’t say much more without being spoilery, but it made me really happy. The plot was also pretty mellow, but I didn’t expect explosions or anything anyways. The focus was more on the contemporary, real elements of the story rather than the fact that GODS ARE REAL, more on her dysfunctional family then MY FAMILY’S MADE OF GODS. It would have been easy to depend on the kitsch of the story, but Kiersten didn’t, and that made me really like it all the more, even if I did wish there was a little bit more Egyptian power worked in. All in all, I found the story really cute, quirky and unique. I loved the Egyptian history lessons that were folded in, and the characters–after the first part–weaved together to tell a touching story about family and love. Isa’s character development was certainly the highlight for me. 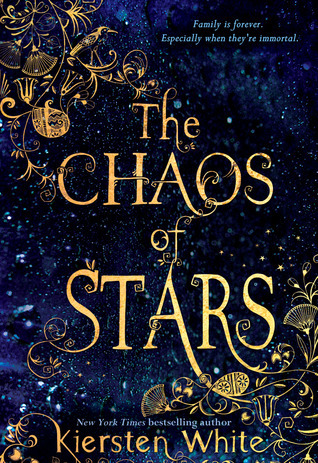 Goodreads doesn’t list this as a series book, but I’ll keep my fingers crossed for another one because there is CLEARLY a huge world Kiersten has set up for herself out there.